A Westbrook Junior College student stands at the entrance steps to Goddard Hall in this black & white candid snapshot labeled 1936 on the front. She wears a winter jacket, long leather gloves, a skirt, dark hose and saddle shoes. 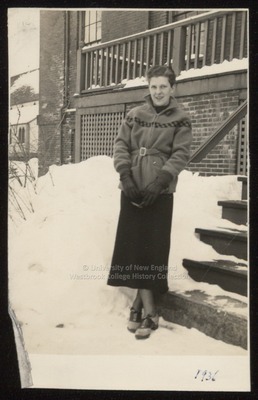 She stands in snow and leans against the Goddard Hall railing. On the back of the photo is written in blue ink: Shirley Cole.